If you’ve got oil, vinegar, eggs, mustard and a whisk, you can make homemade mayonnaise in less than five minutes. Are you up for this (easy) challenge? Whether you fancy Duke’s, Miracle Whip or Kraft, you can recreate the same flavors, and then some, when you make it yourself. And once you’ve mastered the technique, you can use your homemade mayonnaise for dozens of other sauces and dips. Mayonnaise is a permanent emulsion (meaning it won’t separate, like oil and vinegar) made by suspending tiny drops of oil and water (usually with lemon juice or vinegar) in an emulsifying agent (egg yolk, which contains lecithin) using a whisk. It’s an easy at-home condiment to make, tastes so much fresher than store-bought and can be manipulated into dozens of flavor profiles with the addition of simple herbs and spices. The secret to getting mayonnaise to act like mayonnaise is establishing the initial emulsion before streaming in all of the oil. A dollop of mustard, which also contains emulsifying lecithins, and a few drops of oil added to the egg yolks will ensure your emulsion will stick around to form mayonnaise. Once the initial emulsion is formed, the oil can be whisked into the egg yolks in a slow, steady stream. The slower the oil is added, the smaller the oil droplets will be, creating a more stable mayonnaise. 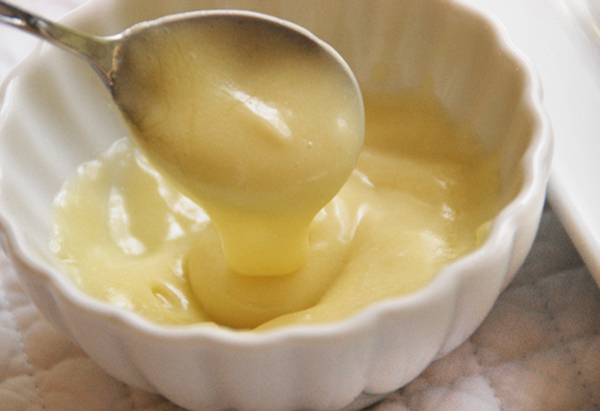 Depending on the oil you use, your homemade mayonnaise will range from ecru to a pale yellow. Olive oils will produce a distinctive fruity-flavored mayonnaise with a pale yellow color, while neutral oils, such as sunflower, will produce a mayonnaise lighter in color and flavor. You can also play with the viscosity of your mayonnaise by the amount of oil you add — the more oil you use, the thicker your mayonnaise will be. Mayonnaise made with olive oil won’t come together as quickly as those made with vegetable or canola oil, but be patient — it will eventually turn into mayonnaise. Mayonnaise requires some serious multi-tasking. The mixing bowl needs to stay steady as you stream in oil with one hand, while the other hand briskly whisks. If you’re smart (like we know you are), you’ll have a mayo-buddy there with you to hold the bowl steady — or use a damp towel to keep the bowl from spinning wildly while you stream and whisk. If your hand-held mixer has a whip attachment, by all means, use it. Otherwise, your small-batch mayo should be whisked by hand since there won’t be enough mass for your standing mixer to mix. In a medium bowl (glass, ceramic or non-reactive material), whisk together the egg yolk, mustard and a few drops of the oil until mixture thickens. While constantly whisking, stream in half of the remaining oil. Add vinegar and whisk until combined. Add salt and pepper to taste. Continue adding oil while whisking until the desired consistency is reached. Stir in additional salt and pepper to taste. Refrigerate covered for up to three days. Add 1 small garlic clove, minced, along with chopped fresh herbs such as tarragon and flat-leaf parsley. A half-teaspoon of organic sugar or honey will create a sweet and tangy mayonnaise (like Miracle Whip). Toasted, ground spices such as curry, cumin seeds or smoked and dried chilies will create a colorful and fragrant mayonnaise and the perfect base for many sauces or dressings. It’s unlikely your eggs will be contaminated with salmonella. And while acid (lemon juice or vinegar) will prevent bacteria from growing, unless you have a kit and can test the pH levels of your mayonnaise at various stages of emulsion, it’s impossible to know if the acid in the mayonnaise has killed any pathogens. But if you’re concerned about salmonella, are pregnant or have a compromised immune system, pasteurize your eggs before making mayonnaise to avoid contamination.